Peatlands form important landscape elements in many parts of the world and play significant roles for biodiversity and global carbon balance. This new edition has been fully revised and updated, documenting the latest advances in areas such as microbial processes and relations between biological processes and hydrology. As well as thoroughly referencing the latest research, the authors expose a rich older literature where an immense repository of natural history has accumulated. The Biology of Peatlands starts with an overview of the main peatland types (marsh, swamp, fen, and bog), before examining the entire range of biota present (microbes, invertebrates, plants, and vertebrates), together with their specific adaptations to peatland habitats. Detailed coverage is devoted to the genus Sphagnum, the most important functional plant group in northern peatlands, although tropical and southern hemisphere peatlands are also covered. 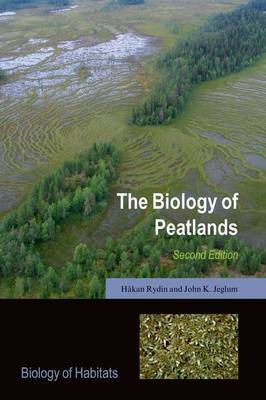 Throughout the book the interactions between organisms and environmental conditions (especially wetness, availability of oxygen, and pH) are emphasized, with chapters on the physical and chemical characteristics of peat, the role of peat as an archive of past vegetation and climate, and peatland succession and development. Several other key factors and processes are then examined, including hydrology and nutrient cycling. The fascinating peatland landforms in different parts of the world are described, together with theories on how they have developed. Human interactions with peatlands are considered in terms of management, conservation, and restoration. A final chapter, new to this edition, focuses on the role of peatlands as sources or sinks for the greenhouse gases carbon dioxide and methane, and the influences of climate change on peatlands. This timely and accessible text is suitable for students and researchers of peatland ecology, as well as providing an authoritative overview for professional ecologists and conservation biologists.